These are good. So. Damn. Good. The first time I made them, I cut off a huge chunk for my sister and told her to share with her boyfriend. I think he only got a few bites. I know by looking at the recipe you’re probably thinking they must be super sweet, but they’re not–they’re just right. The toffee chips are barely noticeable, and the gooey browned marshmallows on top are just delicious. Preheat oven to 350. Grease an 8×8 inch baking dish. In a large bowl, cream together the brown sugar, sugar and butter. Add the eggs and vanilla, beat until fluffy. Add the flour, 2/3 of the chocolate chips**, 1/2 of the marshmallows, all of the toffee bits and the baking powder until thoroughly combined. Pour into a prepared pan and bake 20 minutes or until just set. Sprinkle evenly with remaining marshmallows and chips, return to oven for an additional 5-10 minutes or until a toothpick inserted (not through a marshmallow!) comes out clean. Rachel’s notes: *Mini chips melt faster, but regular chips would work too. **If you are using regular sized chips, you might want to add the chips after the flour so they don’t get broken up. My notes: The store was out of the name brand marshmallows so I had to use the generic ones. Not good–they wouldn’t melt or get gooey. Recipe from Coconut & Lime. these look ridiculous amazing. Going to try a few of your recipes for my x-mas gifts this year. For sure the chocolate covered pretzels and possibly these. I need cute fun toppings for the pretzels. Any suggestions besides candy canes and sprinkles? Also i made you vanilla capcakes (did I already write you about that? I may have) for my son’s b-day party. They were a huge hit. I had to add some cream cheese to the buttercream frosting as it was TOO sweet and the cheese cut it down a little. They were fantastic though. Any good pumpkin bread recipes?? I may barge in on your lunch with Ms. nicole today…. I’m not usually a Blondies fan (give me chocolate all the way), but these look really good! My kids love anything with marshmallows in it, so this may be a big hit with them. Thanks for passing on this recipe! Wow! I’m hungry just looking at this rich, tempting blondie! I’m sure I will eat up the whole pan once I bake these elegant, scrumptious, moist delights! Bring on the sweets! I tried making these tonight and they just didn’t turn out well. I used a glass pan but I didn’t think they would really make a difference. They are runny in the middle and over cooked around the edges. Help? These have been a go to brownie for parties! 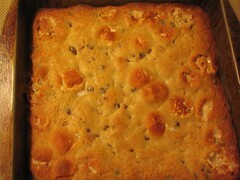 I even added more toffee bits to the last 20 minutes of baking and it rocked! Thanks for the recipe!